A delighted Lara Griffith and the Dr Bechtolsheimer-owned Rubin Al Sad were in winning mode at this year’s LeMieux National Dressage Championships when capturing the prestigious TopSpec Intermediate ll final. 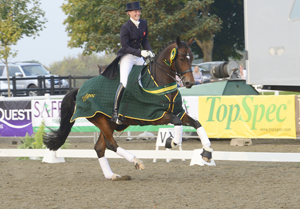 Now 12-years-old and known as Rufus at home, Lara’s broad smile said it all and she was over the moon with his performance; winning the TopSpec championship on 71.95%. Lara has ridden Rufus for the last five years but has taken him slowly after he damaged his back muscle when getting cast in the stable. “He is very special and we didn’t want to rush him so have worked away quietly and I couldn’t be more pleased today,” she added. Zoe Sleigh and Rhodez took the runner-up spot on 68.16%, with Alex Hardwick and Donauwein claiming third on 67.12%. Also at the LeMieux National Dressage Championships HorseHage-sponsored para-dressage rider, Bert (Roberta) Sheffield, was winner of the KBIS Para-dressage Grade III Championship. Bert was riding Double Agent (Darcy) and scored 70.81% to take the crown. Darcy was bought by Bert as a two-year-old after first spotting her as a foal in a picture, and unseen without a rug. 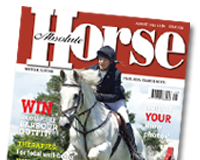 But the gamble paid off and Darcy qualified for the Alltech World Equestrian Games in 2010 as a six-year-old at only her third show at Hartpury CPEDI with a Grade 1b rider.